June 1 has been declared International Farhud Day. To commemorate "The Farhud and the Creation of 850,000 Post-War Jewish Refugees from Arab Lands", Edwin Black, author of The Farhud--Roots of The Arab-Nazi Alliance in the Holocaust , will give the keynote address at an event moderated by Rabbi Elie Abadie (from 1:15 to 2:20 pm, at an official side event at the UN Headquarters in NYC in Hall 7. Those who cannot attend can follow the proceedings here). Over the first two days of June 1941, countless numbers of Jewish women in Baghdad were raped, more than 2,000 Jews were injured — many of them mutilated — and 900 homes, as well as 586 Jewish-owned businesses, were looted. All told, according to Iraqi-born historian Elie Kedourie, 600 Jews, including children and infants, were slaughtered. This Nazi-inspired pogrom is known as the Farhud, which in Kurdish means violent dispossession, and it marked the beginning of the destruction of the Iraq’s 2,600-year-old Jewish community, which beforehand had numbered more than 75,000 in Baghdad and 120,000 throughout Iraq. The Nazis’ influence in Iraq can be traced back to 1933, when Hitler first came to power, which was just a year after Iraq gained its independence from Britain. Excerpts from “Mein Kampf” began appearing serially in Iraqi’s newspaper Al-Alem Al Arabi (The Arabic World), which had been purchased by Germany’s ambassador to Iraq, Dr. Fritz Grobba. A youth organization, Al Fatwaa, similar to the Hitler Youth, was formed, and Radio Berlin began to broadcast anti-Semitic propaganda in Arabic. Pro-Nazis had taken power of the Iraqi government just two months before in a coup staged by Gen. Rashid Ali al-Gaylani and four generals, called the Golden Square, with support from the Grand Mufti of Jerusalem, Haj Amin al-Husseini, a Nazi collaborator in exile in Baghdad. They overthrew the former, pro-British government and exiled the young King Faisal II and his regent, Prince Abdul Ilah. Al-Gaylani, intent on controlling Iraq’s oil fields for Germany, staged the takeover, in league with the Nazis and the Grand Mufti. But Britain, dependent on Iraq’s oil, returned fire by sending in additional troops, and, after a month of fighting, emerged victorious. The British army then stationed itself outside Baghdad, and on May 30, al-Gaylani, his generals and the Grand Mufti fled the country. The regent was to return the next day. And as a delegation of Iraqi Jews was driving across the Al Khurr Bridge to Baghdad’s airport to welcome him, they were attacked by a mob of Iraqi soldiers and civilians. The violence spread from there, while the British remained outside the city, as ordered by British Ambassador Kinahan Cornwallis, who didn’t want to be seen as interfering in Iraqi politics. Finally, on the afternoon of June 2, British forces restored order, but for the Jews, life in Iraq had changed irrevocably. Some Jews fled Iraq immediately after the Farhud. The majority of the Jewish community was non-Zionist, and they stayed. Then, as the persecution of Jews continued, including after Israel became a state in May 1948, they reconsidered, and thousands were smuggled out by the Zionist underground. In March 1950, Iraq passed a law allowing Jews to depart within the year if they relinquished their citizenship. Shortly afterward, in Operations Ezra and Nehemiah, the Israeli government airlifted out more than 100,000 Jews. In March 1951, the Iraqi government extended the law but forbade the Jews to remove any assets. By early 1952, more than 120,000 Jews had participated in the mass emigration, leaving behind approximately 6,000. In 2008 the Jewish Agency of Israel estimated that only seven Jews remained in Iraq. On June 1, 1941, a Sunday, Charles Dabby, then 6, looked out the small recessed window of a second-story bedroom in his family’s house in Baghdad. He could see men breaking into nearby homes on the narrow street below, then hoisting stolen items over their heads or hauling them away in donkey-driven carts. “People were taking sheets, pillows, everything and anything,” he recalled. He also heard the shouts and crying of both adults and children. The family felt reassured by the presence of Azawi ibn Tabra, the large, Muslim owner of the warehouse where Charles’ father, Heskel, a spice importer and distributor, stored his merchandize. The keffiyah-clad Azawi was standing guard outside the family’s front door, a sword in one hand and a gun on his left side, patrolling back and forth. A few men accompanied him. He had also stationed several men on the Dabbys’ roof in case attackers jumped over the short wall separating the flat, attached roofs of the adjoining houses. Another guard remained inside the house, making funny faces to entertain Charles. Later, Heskel led the family downstairs to the basement, where they slept for several nights. It was too dangerous to sleep on the rooftop, as was the custom in warm weather. After the Farhud, when Charles walked with his father along Main Street to school, they often saw men hanging from scaffolding. When Charles asked why they had been hanged, Heskel answered, “Because they’re thieves.” He never explained that they were Jews. On May 14, 1948, Charles remembers listening to the United Nations vote on Israeli statehood on the family radio. “I could hear my heart. I was crying,” he said. He had secretly begun learning conversational Hebrew, leaving school for an hour at a time for classes taught by young Iraqi Jews. At home, he buried his Hebrew papers in a box in the backyard, hidden from his parents. “They would panic,” he said. Like most Iraqi Jews, Charles’ parents were not Zionists. Then, one afternoon in 1949, as Charles rode his bicycle home from school, two boys attacked him — hitting him and trying to steal his bicycle. Charles removed his belt and began thrashing the boys and destroying their bicycles. He returned home with torn clothes, his own bicycle on his shoulder. That night, after learning that the boys’ parents had important government jobs, Heskel put Charles on a train to Basra, to stay with his uncle. In the summer, against his uncle’s and father’s wishes, Charles crossed into Iran with a smuggler and, after some time in Istanbul, he traveled to Israel. 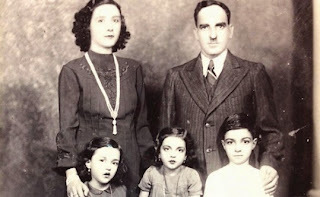 His two sisters followed a year later, when Iraq allowed Jews to emigrate, while forbidding them to keep their Iraqi citizenship. Prof Norman Stillman has one or several documents about the Farhud in his document collection about Jews in Arab lands. here are blog posts on the farhud and how it has been treated by historians and others.